What does MRC Prodigy‘s WiFi Module do? It allows you to run your Prodigy DCC railroad wirelessly from your Apple® or Android™ smartphone or other mobile device*. What do I need? 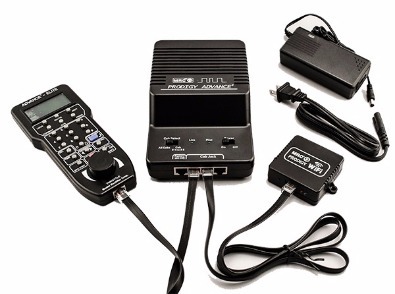 Start with an MRC-Prodigy DCC system. Buy the MRC Prodigy WiFi Module (#0001530). Download the WiThrottle or Engine Driver App to your smartphone and you’re ready to run. What don’t I need with a Prodigy WiFi Module? Unlike other systems, only MRC delivers plug’n play simplicity. There’s no wiring needed. No need to navigate complex, JMRI® software. No need for a computer interface. No need for a Bluetooth® connection. No need for a home network to run your layout. How many operators can use it simultaneously? Invite friends to run on your railroad… all they need to bring is their smartphones. Once the appropriate app is downloaded, each phone becomes a wireless throttle. Run up to eight smartphones on a single module. What "Cab Number" should my MRC Prodigy WiFi Module be set to? 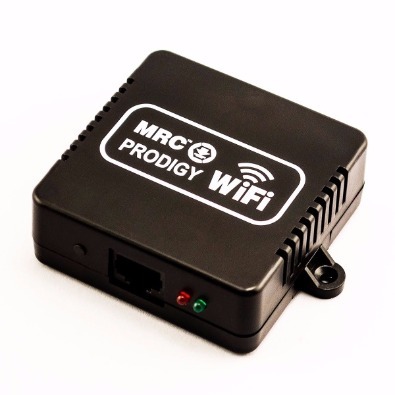 Your MRC Prodigy WiFi Module, has a factory default cab #2, as your MRC Prodigy system handheld has a default cab #1. If you wish to add more handhelds or modules, you will need to set each unit to its own cab number. Am I limited to specific brands of locos or decoders? No. MRC’s WiFi Module works with any brand loco, any brand decoder. Who should buy an MRC WiFi Module? If you’re using a wired Prodigy system, our WiFi Module will give you untethered, wireless control. If you are considering buying a DCC system, choose Prodigy and enjoy the wireless smartphone advantages of our WiFi Module. If you presently own a Prodigy system, add the benefits and enjoyment of wirelessly controlling your railroad from your smartphone. We didn’t invent smartphone control of a model railroad, we just perfected it. Made it convenient. Made it easy to use. Gave it more features, including plug ‘n play simplicity. *iPhone, iPad, and iPod touch are trademarks of Apple Inc., registered in the U.S. and other countries.